Joanne White posted Sunday May 6, 2018. Last night Ausdeck Patios and Roofing Archerfield Speedway played host to night one of the 2017-2018 Queensland Sprintcar Title, with thirty-one Sprintcars set to battle it out. It was a somewhat unusual night at the Speedway, with Lachlan McHugh and Luke Oldfield some of the early casualties, but in the end it was Ryan Jones from South Australia who upstaged the locals and got the win the Preliminary A-Main. Jones had been strong all night, qualifying inside the top five before claiming a win and a fourth in his heats to place him highest on points going into the main race for the night. Jones started from pole position in the twenty-lap Preliminary Feature, before quickly securing the lead, and, twenty-laps later, the win. The battle raged behind him though, with Jayden Peacock running in second for most of the race with Michael Saller and Andrew Scheuerle close behind. Scheuerle was magnificent, focused and determined, the Ausdeck Patios Q25 racer boldly running the top, relentlessly working the top side as he tried to find a way around Saller, before turning his attention to Peacock. The battle between Peacock and Scheuerle was phenomenal, with Scheuerle eventually getting around the outside of Peacock with only a few laps to go. Andrew Scheuerle finished second with Jayden Peacock crossing the line in third to round out the Preliminary A-Main podium. Michael Saller and Peter Lack rounded out the top five, while Mark Pholi, who finished sixth, worked his way forward after starting from position twelve, showing incredible speed and challenging Lack for fifth late in the race. The drama started early though. Brett Minett was the first casualty of the night, suffering mechanical issues in the Q94 racer during hot laps and taking no further part in proceedings. Lachlan McHugh was next to strike trouble, engine problems in the Q23 racer as he started his qualifying lap saw him fail to record a qualifying time and, without a viable spare motor to drop into the car, subsequently withdrew from the weekend. Peter Milnes also endured some dramas in the V51 racer and failed to complete qualifying. Luke Oldfield topped the leader board once qualifying was completed, stopping the clock at an impressive 11.824 seconds. Oldfield was the only driver able to break into the 11-second bracket, with Bryan Mann second quickest after stopping the clock at 12.065 seconds. Peter Lack (12.086), Ryan Jones (12.093) and Jayden Peacock (12.135) rounding out the fastest five. Brent Kratzmann and Allan Woods recorded identical times, both stopping the clock at 12.682 seconds, the pair just four thousandths of a second slower than Kevin Titman, who was only 0.006 seconds behind Andrew Scheuerle. As heat one started to push off for the start disaster struck for Luke Oldfield, the Q17 racer refusing to fire. The race started with Oldfield on the infield and Karl Hoffmans from pole position. Kristy Bonsey shared the front row with Hoffmans for the start and quickly secured the lead when the green flag flew. Dave Whell, from position four, was quick to follow Bonsey on the high line, racing around the outside of Hoffmans and setting out after Bonsey. Behind them Brent Kratzmann had a look up the inside of Kevin Titman, only to surrender a position to Mitchell Gee who was exceptionally quick on the top side. With plenty of momentum in the Q36 racer Gee quickly turned his attention to Titman, racing around the Q59 racer as they navigated turn four, with Kratzmann persistent on the bottom. Gee and Kratzmann raced either side of Titman as they completed the first lap of the race, with the pair then attempting to race side-by-side up the inside of Hoffmans. Unfortunately contact between them saw Kratzmann cartwheel through turn one and left Gee with enough damage to end his race as well. Neither driver was injured, but both were unable to restart the race, losing some valuable and much needed points. Bonsey led the restart from Whell and Brad Ayers, while Hoffmans tried to defend his position from Titman, and Michael Saller tried to find his way in front of Titman. Saller raced underneath Titman in turn four just a few laps into the race, before getting underneath Hoffmans a couple of laps later. At the front of the field Whell was quickly closing in on Bonsey, catching the Q42 racer with one lap left to run. Whell had a huge look underneath Bonsey in turn two but Bonsey fought back valiantly, refusing to surrender the lead without a fight. Whell had another look as they entered turn three, committed to the bottom, while Bonsey fought back on the top side. Bonsey gave it everything, the pair side-by-side as the exited the final corner of the race, but it was Dave Whell who was first past the chequered flag, taking the win ahead of Kristy Bonsey, Brad Ayers, Michael Saller, Karl Hoffmans and Kevin Titman. Liam Atkinson, Mitchell Gee, Brent Kratzmann and Luke Oldfield all failed to finish the event. Kris Jennings and Stewart Craig lined up alongside each other for the start of heat two, with Craig getting the better start and leading the field into turn one. Brodie Tulloch, from position four, had started to follow Craig on the high side, but chaos unfolded behind them when Jayden Peacock got a little sideways in turn one, forcing the rest of the field to take evasive action. Dan Murray did everything he could to avoid contact, but there was nowhere to go and little time to stop. The resulting contact was Murray gently inverting the Q44 racer and bringing the race to a stop. Murray restarted the race from the rear of the field as Jennings and Craig led them around for the second attempt at a start. This time it was Jennings who got the better start, quickly securing the lead ahead of Craig, while Randy Morgan, Allan Woods and Andrew Scheuerle all made their way up the inside of Brodie Tulloch. Woods raced up the inside of Morgan, before having a huge look underneath Craig, while Scheuerle made his way past Morgan and set out after Woods. Scheuerle raced his way underneath Woods as they rounded turn one, only to find himself on the tail of his car owner, Stewart Craig. Scheuerle ran a fraction wide in turn four, allowing Woods to slip back through, with Woods then quickly making his way underneath Craig. Scheuerle followed moments later, while Jayden Peacock seemingly came out of nowhere and, with remarkable speed in the Q77 racer, used the low line to slip underneath both Craig and Scheuerle in one perfectly timed run on the bottom as they rounded turn four. Allan Woods relieved Kris Jennings of the race lead, with Jennings fading as Peacock and Scheuerle made their way closer to the front. Peacock quickly caught Woods, making it all look too easy as he raced underneath the Q28 racer to take control of the race a few laps from home. Jayden Peacock got the win while Allan Woods held onto second despite mounting pressure from Andrew Scheuerle in the final few laps. Scheuerle crossed the line in third and led Bryan Mann, Kris Jennings, Randy Morgan, Brodie Tulloch, Stewart Craig, Dan Murray and Peter Milnes across the line. Andrew Corbet started heat three from pole position with Mark Pholi alongside and Anthony Lambert and Brock Dean from row two. Corbet won the first start, settling into the race lead ahead of Pholi while Dean ran around the outside of Lambert trying to secure third. Ryan Jones had a spin in turn one and brought the race under caution before restarting at the rear of the field. A full restart followed with Corbet again securing the lead, but with Pholi all over his tail this time. Pholi was relentless while behind him Dean made his way around Lambert and Jones started to make his way forward. Jones made his way around the outside of Darren Jensen in the opening corner, before racing around the top-side of Cody Maroske in turn three, and looking to get around Mick Sauer. Sauer raced underneath Lambert as Jones went around the top, the trio three-wide through turn four, with Sauer on the bottom securing the advantage. Sauer set out after Dean and Pholi, with Jones in pursuit, while Dean challenged Pholi for second with a massive look on the inside of the Q14 racer as they navigated turn two. Dean got the job done half a lap later, but Pholi fought back to regain his position soon after, while behind them Jones got the better of Sauer and began closing in fast. Jones and Dean traded places a couple of times as they closed in on the leaders, while Pholi challenged Corbet for the lead. Jones raced around Dean and Pholi as they rounded turn two, before switching to the bottom and having a look underneath Corbet as they raced through turn three. Jones, who has not had a lot of luck in Brisbane the last couple of weeks, headed back to the top side, and with three laps still to run, soon raced around Corbet to take control of the race. Peter Lack and Darren Jensen had an intense battle deep in the field for most of the race, but it was Ryan Jones who went on to take the win with Andrew Corbet home in second ahead of Brock Dean and Mark Pholi. Anthony Lambert crossed the line in fifth and led Peter Lack, Mick Sauer, Darren Jensen and Cody Maroske home. Stewart Craig was scheduled to start heat four from pole position but when the Q9 racer did not start the event Brodie Tulloch was elevated to the front row, with Karl Hoffmans alongside. Tulloch and Hoffmans raced wheel-to-wheel into the first corner, but it was Tulloch who emerged in front, leaving Hoffmans in second, with Brad Ayers, Andrew Scheuerle and Brent Kratzmann on his tail. Kratzmann had a look up the inside of Scheuerle, while Scheuerle tried for an inside run on Ayers, while behind them Michael Saller tried to find a way in front of Jayden Peacock. Scheuerle got underneath Ayers and Hoffmans, just as Tulloch slowed on the top side, a mechanical problem in the Q43 racer prematurely ending his race. Hoffmans spun in turn three as the yellows came on, leaving Ayers to lead the restart from Scheuerle and Kratzmann. Ayers immediately opened a small lead over Scheuerle, while Peacock challenged Kratzmann for third. Scheuerle and Kratzmann began closing in on Ayers, with Scheuerle inheriting the lead when Ayers spun the NQ11 racer in turn one. Andrew Scheuerle went on to take the win ahead of Brent Kratzmann and Jayden Peacock, with Michael Saller and Brad Ayers rounding out the finishers. Karl Hoffmans was officially sixth, having received a mechanical defect flag for a flat left front tyre, while Brodie Tulloch failed to finish the event. Kristy Bonsey lead the field to the green in heat five, starting from pole position with Andrew Corbet alongside. Bonsey got a brilliant start and quickly secured the lead, leaving Corbet in second head of Dave Whell, Anthony Lambert and Kevin Titman. Deep in the field Mitchell Gee had a moment in turn two, surrendering positions to Cody Maroske, Darren Jensen and Peter Lack, while closer to the front Whell found a way past Corbet, leaving Corbet with a hard-charging Titman on his tail. Lambert had a look on the inside of Titman, while Gee started making up lost ground. Gee made his way back past Jensen, before trading places back and forth with Lack for a few laps, with Gee eventually getting the better of the Q5 racer. Gee turn his attention to Maroske, working the high line as he tried to find a way around, the pair switching places numerous times as they fought over mid-field positions, while in front of the them Lambert was still persisting on the bottom and trying to get underneath Titman and Corbet. Titman attempted a bold move around the outside of Corbet as they raced down the back straight, but contact between the pair could have so easily ended in disaster for both. Fortunately though both drivers managed to recover well, with neither losing a position, while behind them things were heating up between Gee and Maroske. Gee worked the bottom, Maroske the top, the pair side-by-side as they searched for a way past Lambert, with Maroske getting the job done around the top side in turn four, moments before Gee slid through on the bottom with one lap left to run. The pair remained wheel-to-wheel for the final lap, with Maroske the first of the duo past the chequered flag, just 0.182 seconds ahead of Gee. Kristy Bonsey was untroubled in the race lead, comfortably taking the win with a margin of just over two seconds to Dave Whell in second. Andrew Corbet crossed the line in third and led Kevin Titman, Cody Maroske, Mitchell Gee, Anthony Lambert, Peter Lack, Darren Jensen and Liam Atkinson across the line. Mark Pholi started heat six from pole position and while fellow front row starter Kris Jennings momentarily got his nose in front as they entered turn one, it was Pholi who secured the race lead. Jennings held down second ahead of Randy Morgan, but Allan Woods was on a mission to get to the front and slipped up the inside of both Morgan and Jennings by the end of the first lap. Mick Sauer got through underneath Morgan and set his sights on Jennings, while Ryan Jones began making his way forward from the back of the field. Jones raced around Dean in turn one, before slipping underneath Morgan a lap later, while Sauer and Jennings almost came together on the back straight as Sauer raced up the inside of the Q81 racer of Jennings. Jones spent just half a lap catching Jennings and taking his position, before setting out after Sauer, while Brock Dean and Randy Morgan were left to try to find a way past Jennings. Morgan however suffered mechanical problems in the Q54 racer and slowed unexpectedly on the pole line, with Dean, Bryan Mann and Dan Murray forced to take evasive action as Morgan tried to exit the racetrack. Contact between Dean and Mann saw both cars hit the wall, with Mann, now with front end damage on the Q16 racer, careering onto the infield, and Dean stopping high on the track entering turn two. Dean, Mann and Morgan all failed to restart the race. Pholi led the restart from Woods and Sauer, with Jones in fourth. Jones started challenging Sauer for third but contact between the pair in turn two saw Sauer invert the Q69 racer. Sauer walked away from the wreck a little sore, while Jones was sent to the rear of the depleted field for the restart. Mark Pholi went on to take the win ahead of Allan Woods and Dan Murray, with Ryan Jones and Kris Jennings rounding out the finishers. Mick Sauer, Brock Dean, Bryan Mann and Randy Morgan all failed to finish the race. Sixteen cars rolled onto the track for the Preliminary A-Main, to be held over twenty laps. Luke Oldfield still sat in fourteenth, thanks to his quick time in qualifying, but with Oldfield out for the night, Brent Kratzmann got his start in the Preliminary Feature. Ryan Jones and Jayden Peacock led the field to the green, with Jones quickly securing the lead while Andrew Scheuerle and Michael Saller both tried to race up the inside of Peacock as they entered turn one. Peacock was quick on the top side though and managed to secure second ahead of Saller and Scheuerle, while Kratzmann started making his way forward from the rear of the field. Scheuerle was putting all kinds of pressure on Saller, while Peter Lack, Bryan Mann, Kevin Titman, Allan Woods and Mark Pholi chased Dave Whell for the minor places. Pholi was phenomenal on the bottom, racing underneath Woods and almost getting by Titman at the same time. Titman fought back on the high side, racing side-by-side with Pholi, while Kratzmann and Mitchell Gee began weaving their way forward from the back of the field, the pair attempting to race either side of Darren Jensen but unable to get the job done. Meanwhile Scheuerle finally managed to get the better of Saller before turning his attention to Peacock, while behind them Peter Lack and Bryan Mann were all over the back of Dave Whell, and further back, Kratzmann had got the better of Gee and Jensen. Allan Woods slid boldly underneath Titman, slipping straight into position right behind Pholi before leaving an opening on the bottom for Titman to get back through. Woods slowed to a stop a couple of laps later and brought the race under caution with twelve laps still to run. 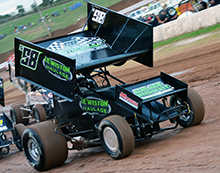 Ryan Jones led the restart from Jayden Peacock and Andrew Scheuerle, with Scheuerle immediately under pressure from Michael Saller. Brent Kratzmann made his way past Brad Ayers and while Ayers tried to fight back Mitchell Gee charged through on the bottom. Contact with Kratzmann and Ayers spun Gee around and while he was able to keep the car moving and rejoin the race, it cost him a number of positions. Dave Whell and Mark Pholi exchanged places a few times, with Kevin Titman right on their tail, while behind them Bryan Mann and Brent Kratzmann negotiated over track position, the pair switching places back a forth, with Kratzmann eventually securing the advantage. Scheuerle stepped up the pressure on Peacock as the laps wore away, timing his run to perfection and persisting on the high line, relentlessly searching for a way around the top. Scheuerle did not waver, did not search for a different way through, he had the speed on the top and the tenacity to stick to it and get the job done. Peacock was fast, and consistent, but Scheuerle was unrelenting and, with a few laps left to run, raced around the top side of Peacock as they rounded turn four. From there Scheuerle started to pull away, proving just how much momentum he had in the Ausdeck Patios Q25, while further back in the field Peter Lack and Mark Pholi traded blows as the argued over fifth, and Dave Whell, Brent Kratzmann and Kevin Titman captivated the crowd as they raced for positions just inside the top ten. Ryan Jones got the win with Andrew Scheuerle in second ahead of Jayden Peacock, Michael Saller and Peter Lack. Mark Pholi crossed the line in sixth ahead of Dave Whell, Kevin Titman, Brent Kratzmann, Bryan Mann, Mitchell Gee, Brad Ayers, Dan Murray, Kristy Bonsey and Darren Jensen. Allan Woods did not finish the event. Sprintcars return to Ausdeck Patios and Roofing Archerfield Speedway tonight, for what is sure to be a thrilling conclusion to the 2018 Queensland Title. See you trackside!